Editor note: MAKE’s Illustrated Board Glossary is featured in our just released Vol. 36–the board’s issue. Read all about it here. Like what you see? Subscribe right here. Development boards come in many different types and sizes, with vastly different feature sets. Comparing the particular spec of one board directly to another will rarely give you the full picture. Here are some of the common parts and terms that come into play when evaluating different boards. The chip at the core of your board. It’s the brain of your project, handling most of the functionality. Most processors can be classified as either a microcontroller, designed to control basic digital electronics, or a system on chip (SoC), which are more powerful processors similar to those in computers. Boards with SoCs are often called single-board computers (SBC). Sockets that you use to connect LEDs, buttons, sensors, relays, motors, and other parts. You’ll typically use a separate breadboard (a small panel with rows of sockets) and jumper wires to connect your board’s I/O pins to electronic components while you’re prototyping or developing your project. The pins come in a few varieties, and often have multiple capabilities. Digital pins can read and control digital components. Analog input pins can read a range of voltages from analog components such as temperature sensors and dials. PWM pins allow for digital emulation of analog output. Some pins can also use communication protocols such as serial, SPI, I2C, or CAN bus to talk to other devices. For powering the board. Some boards accept a range of voltages, many others accept only 5 volts. Usually in the form of a DC barrel jack (pictured) or USB connector. Usable to indicate a status (in the case of an LED) or as an input (in the case of a button) without the need to wire up any additional circuitry. Other on-board LEDs may indicate whether the board is powered on, transmitting or receiving data, or accessing the flash memory. On-board Ethernet ports, standard on most SoC boards and certain microcontrollers, allow you to connect to the internet via your router. Some boards even have built-in wi-fi chips for wireless connectivity. For connecting peripherals such as keyboards, mice, cameras, and wi-fi adapters. Available on many boards, especially those with an SoC processor. Some boards connect to your computer via USB so you can reprogram the chip. Printed circuit boards that attach onto your development board to give it additional functionality such as Bluetooth, cellular, GPS, sound, graphics, and motor control. Also called shields with Arduino and capes with BeagleBone. As microcontrollers and SoCs continue to advance, many expansion board functions are becoming incorporated directly into them. Where you write, compile, and debug your code. Many platforms use IDE software on your computer that also takes care of programming the chip, usually via its USB connector. 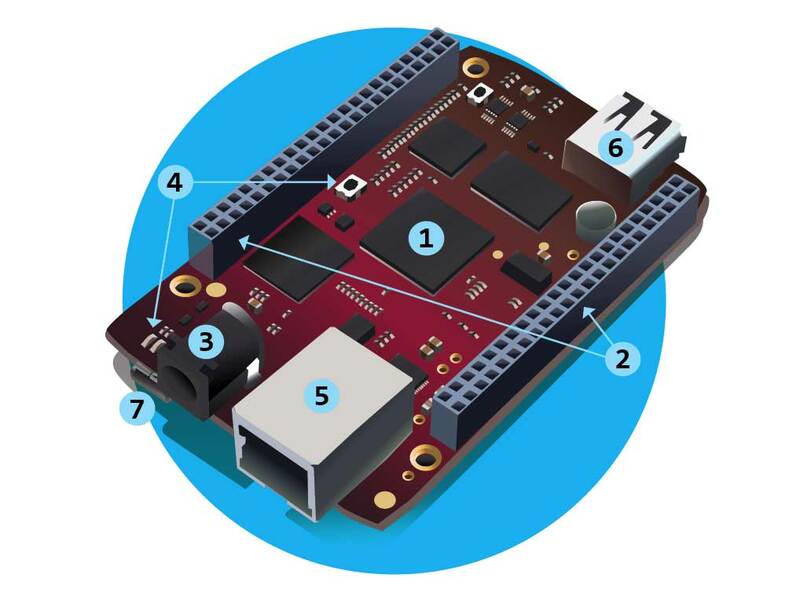 Some network-enabled boards have a web-based IDE, so that you can use your internet browser to connect to the board and program it that way. Downloadable prewritten code that help you by making complex coding tasks much simpler. Frequently written to work with a particular board.